Opening Hours: Daily 10am to 6pm. Decorated by Danny McDermott & Tom Binns (Project Manager). Crocodiles, Spiders and some mini Gruffalo helpers on the top step ~ all making Tam, Andy & Emma a bit more ' Handy' at An Clachan. A captivated audience on the steps of An Clachan for Tam Dean ' Stickman ' Burn & Co.
Tam Dean Burn making ' Room on the Broom ' to channel a wee bit of Satchmo . . . with Andy Alston on the keys.
' A squash & a squeeze ' for Andy Alston at the piano, with Tam Dean Burn and Emma Schad on the booksonabike marathon storytelling tour at An Clachan cafe. You can't get a minutes peace these days, with mobile phones going off constantly and weans stealing your thunder. Andy was quoted as saying: " I can't possibly work under these conditions ! " The only way to travel ! . 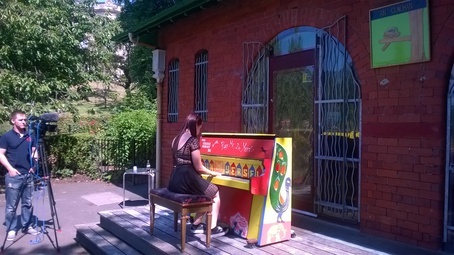 . . on the piano trail in Glasgow with Graeme Stokes never feeling more regal en route from Glasgow Royal Concert Hall to An Clachan Cafe in Kelvingrove Park with Tom Brown pedaling hard up onto Bath Street. Karen Long playing a wee bit of Einaudi at An Clachan cafe while Colin Stone films for STV Glasgow Riverside show. 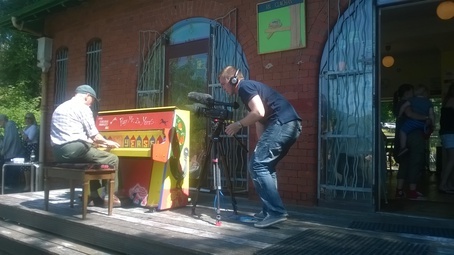 Graeme Stokes giving us a few tunes on the deck at An Clachan while Colin Stone films for STV Glasgow. Karen Long playing ' Yogi ' out on the decking at An Clachan Cafe while Colin Stone from STV Glasgow Riverside show is filming.